There are not only super cars and sports bikes enthusiasts in Dubai, but you will also find cycle aficionados in this city too. These devotees of cycling can be found in decent numbers, which can be judged from the number of bike shops operating in Dubai. One of these top bike shops in Dubai is Ride Bike Shop that is located in Festival Centre and sells almost all kinds of bicycles in this city. Their stock ranges from sports to lifestyle cycles, professional to road and off road bikes. In addition to this, Ride Bike Shop also provides maintenance service to its customers in its in-house workshop. 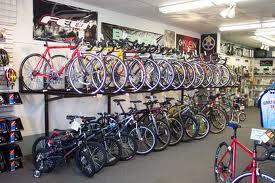 Moreover, cycle fans can also get various accessories of their bikes from this wonderful shop. Ride Bike Shop is one of the well-known bike shops in Dubai, as it maintains an extensive stock of road, mountain and BMX bikes in different sizes and shapes. In addition to this, they also provide various services related to bikes such as tube change, wheel alignment, wheel re-build, medium service, full service and etc. In addition to this, people of Dubai can also get numerous accessories for their bikes from this bike shop. These accessories are affordable and superior in quality too plus customers will find variety too. This bike shop remains open from 10:00 am to 10:00 pm between Sunday and Wednesday, whereas from Thursday to Saturday its opening hours are between 10:00 am till midnight. Al Rebat Street, Festival Centre, Festival City - Dubai - United Arab Emirates. Ride Bike Shop is tucked in the Festival Centre that has got no metro station within its 2.5 kilometres radius. Therefore, to get to this site car and bus are the best options. 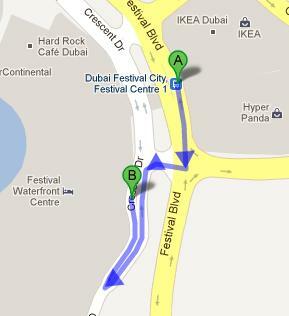 Dubai Festival City, Festival Centre 1 – Dubai bus stop is 750 meters far from Ride Bike Shop in festival Centre. This makes it a walking journey of about 10 minutes, if a person heads south on Festival Blvd from this bus station after arriving here by using any of these bus numbers 4, 44, 53 or F08 and then turn right towards Crescent Dr, from where bus user should make a slight left turn onto Crescent Dr. After that bus user will make a sharp right turn by staying on Crescent Dr to reach Festival Centre, where Ride Bike Shop is located. View map for directions.